Solar energy through the use of solar panels is being used not only in the Philippines but also across the entire world. People are now turning to renewable energy in an effort to save the environment from global warming. 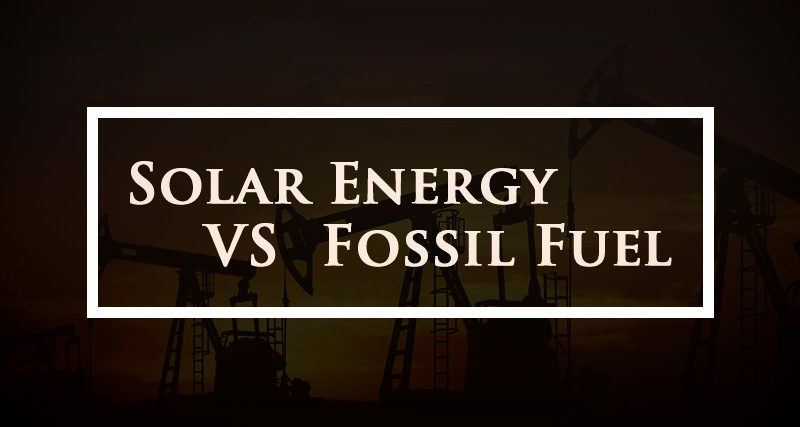 However, there are still some individuals and industries that prefer to use fossil fuels to produce the energy they need for their daily activities. If you are unsure about which one to turn to, then you may want to continue reading below as this article will compare and contrast solar energy from fossil fuels. Solar energy is an important source of renewable energy. Basically, it comes from the heat and the radiant light the sun produces. A wide range of technologies including but not limited to artificial photosynthesis, solar architecture, solar thermal energy, photovoltaic, and solar heating are able to harness the sun’s energy and turn it into solar power. The International Energy Agency supports the use of solar energy for it can aid the efforts to decrease the causes of a worsening global warming. These fuels are made through natural means; anaerobic decomposition of dead organisms is one of them. Anthracite coal, petroleum, and methane can be classified as fossil fuels. These materials can be both volatile and non-volatile. They are not considered as a form of renewable energy because they take at least a mega-annum to be formed and created. Fossil fuel reserves are also being exhausted much faster than new reserves are being created. Fossil fuels have high percentages of natural gas, coal, petroleum, and carbon contained in them. Burning them results in a huge amount of carbon dioxide being produced in the environment. This chemical compound heightens climate forcing which then leads to global warming. Why Should You Use Solar Energy rather than Fossil Fuels? By now, you have enough information to support renewable energy like solar power than fossil fuels. You could truly save the Earth from global warming and climate change. But if you need more convincing, then here are more reasons why you should make this effort. Investment – There is a high possibility that you will see an economic shift from fossil fuels to clean or renewable energy. HSBC is predicting that stricter regulations regarding the climate can be put in place. This would mean that companies producing fossil fuels can be restricted from getting unused fuels that can be found underground. Ultimately, this may result into their fall. Cost and Capacity – Solar panel installations are slowly escalating at a thrilling rate due to its cost drastically dropping. It is expected that this development will continue in the future. On the other hand, the cost of coal and other fossil fuels are rising because of the implementation of sterner environmental regulations. Jobs – In the United States, the solar energy industry is able to hire more and more people. A total of 20,000 new jobs were handed out in 2013 by the various solar companies across America whereas the industry for fossil fuels is slowly but surely cutting jobs since 2012. This could be another result of stricter regulations being put in place. All the reasons discussed above should really be enough for everyone to at least consider using solar energy (and other forms of renewable energy). Each and every individual has a responsibility towards this Earth. All of us can work together to produce a cleaner and brighter future not only for the next generation but also for the current one.